Unique story of a village's attempts to solve drought by appealing to the powers of a mysterious mountain-dwelling diviner. A nuanced, subtle view into an unfamiliar culture and mythos. I saw Chac when it first came out, and have wanted to see it again ever since. I have now seen the restored film, And I was not disappointed. 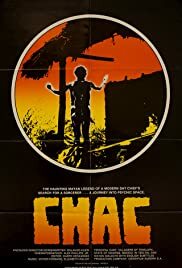 Chac is an amazing and unique film. Made entirely with non actors, they give a better performance than any professionals could have. Chac is a simple and direct folk tale, but rich with subtleties. The story reminds one of something by B. Traven, the reclusive author of The Treasure Of Sierra Madre and Macario. The setting, the forests of Chiapas, Mexico, reminds one of John Boorman's The Emerald Forest, but is completely lacking in artifice. The direct, but nuanced portrayals of the characters and story is much like Japanese film, such as Kurosawa's Seven Samurai. It could only be made by someone who knows and cares for its subjects deeply. It is a setting, culture and mythos unfamiliar to most of us, that is presented in such a way as to be at once mystical, and as ordinary as walking across the street. I highly recommend it. The restored print looked good, but this is not Hollywood film making, and was made under difficult conditions, to say the least. The only damage I saw as a distraction is a small colored scratch in the center of the screen during a very dark scene with small, lit subjects in the middle of the screen. There are also variations in the color of film stock.